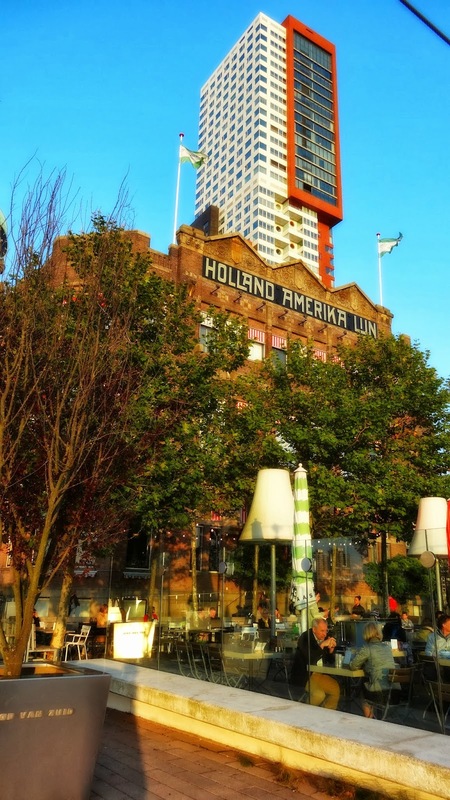 The New York Hotel is the stunning building at the end of the Wilhelmina Pier in Rotterdam. It used to host the headquarters of the Holland-America Line, which for several decades of the Nineteenth and Twentieth centuries transported emigrants, fortune seekers and the first class wealthiest across the Atlantic Ocean, to a new world and a new life. It hosts now a posh, nostalgic hotel and cafe' and restaurant on the ground floor. We drove by yesterday evening in the warm sunset light and regretted that we did not have time to stop and have a drink in the sheltered terrace on the pier, watching the sun disappear behind Rotterdam harbour's cranes.